Kylie Jenner and her boyfriend Tyga are excepting a baby without marriage. Home Article Kylie Jenner and her boyfriend Tyga are excepting a baby without marriage. Kylie Kristen Jenner the famous reality TV personality from Keeping up with Kardashians is the hot topic in the town. Kylie is 19-year-old and she is already pregnant or so Medias, social networking sites and news report say or is it just a rumour like other rumours that keep circling around. Kylie Kristen Jenner the famous reality TV personality from 'Keeping up with Kardashians' is the hot topic in the town. Kylie is 19-year-old and she is already pregnant or so Medias, social networking sites, and news report say or is it just a rumor like any other baseless rumors. The father of the baby is said to be non-other than her current boyfriend Tyga the 29-year-old rapper who has already experience fatherhood as he has a son from his past relationship and his name is Cario who is now 3-years-old. ‘I keep a list in my phone of names I like for my future kids,' the teen revealed. 'But they're my secrets for now!' This statement was said by Kylie Jenner to her BBF Jordyn Woods on TheKylieJenner.com a subscriber based app. Hmm.. This gives us a hint, does not it? She also hoped to have a family and children before she hits 30. She does not believe in after 30 to start a family and she also said she would like to have a big family in her interviews with a magazine but we know she does not have to rush things that fast she is famous, young and has a great Career come on !! she is just a teenager. Is Kylie Jenner really Pregnant before marriage? On her reality show 'Keeping up with Kardashians', she discusses this topic with her sisters. The rumors of her getting pregnant, or getting married have certainly become a hot topic but as per Kylie, she is not ready to get married anytime sooner. 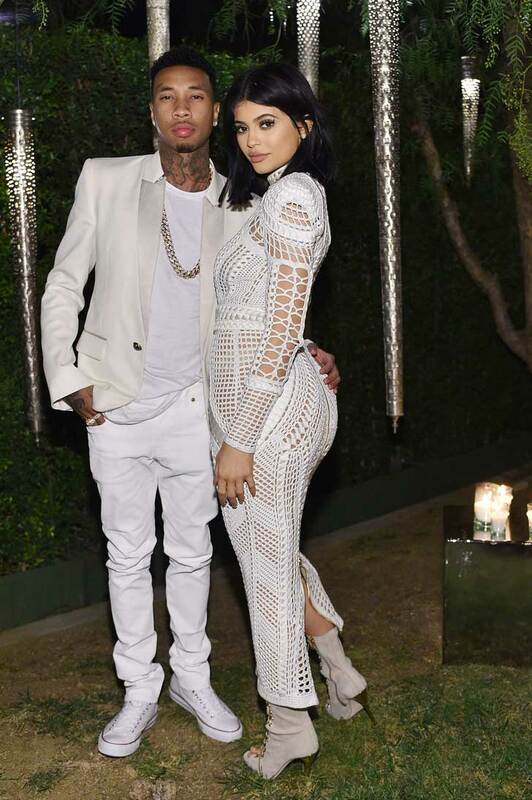 There was also buzz that Tyga and Kylie are getting engaged and planning for a family. To stop this rumor she did spoke on her app live stream in the video. Tyga asked Kylie “Are you pregnant?” "I think we need to address that rumor because I feel like everybody thinks you're pregnant and there's a new story every day about you being pregnant and being married and all this crazy stuff so you need to talk about those type of things." "I'm not pregnant and I'm not married," Jenner said, jokingly adding, " 'Cause you're slacking ...I'm just kidding." from the statement, we can see that she wants to get married but to clear this statement she adds up that she is just a kid and needs time. There are rumors that they will get married but it will take time I guess. Recently, Kylie was interacting with her fans through her Snapchat account and when fans asked about the kids and how many kids she will have she answered she do want kids but not now. On the same Snap chats, her boyfriend posted this to make her feel good. so she replied laughingly I'm dying!" "That's why I love Tyga -- he always makes me feel better. He just sent me the funniest seems because my friends canceled on me." The lovely couple was never meant to hide their relationship from the media. It all started after Tyga broke up with Blac Chyna. Blac and Tyga broke up after 1 month of their engagement. They both has a son King Cario Stevenson. In past Tyga did perform in Kendall Jenner’s birthday bash at that time Kylie was just 14-year-old and there was little flirting there. In October 2014 Kyle started popping up in Tyga's social media site. They started dating in late 2014. In April 2015 he got a tattoo of Kylie on his hand. On her 18th birthday, Tyga gifted Kyle with Ferrari 458 convertible which net worth is minimum $250,000. Kylie and her boyfriend have off and on a relationship but who does not. They are both young and Successfully people. They are young and Kylie is just 19 and she has a promising career ahead of her. Let the couple be and let them enjoy their lives for now and when the time will come, Kylie will be a happy mother and wife of her loving husband. Kylie is currently in a relationship with rapper Travis Scott. The couple has a daughter named Stormi Webster born on 1st February 2018.